< "Junk Status" for South Africa. It's Real impact? In today's blog we take a look at South Africa's various public sector entities Capital Expenditure (Capex) for 2015 and 2016. Capex is capital expenditure on various fixed and operating assets including Land, buildings, machinery and equipment, transport equipment etc. With government promising to tighten it's belt with regards to its overall spending, has this affected capex, which one would expect to increase due to increased demand for the delivery of services to the people of South Africa? The short answer to this is that it has not really affected the growth in capex, with it increasing by around 7% from 2015 to 2016. The bar chart below shows the overall levels of capex for the main Public sector groups for both 2015 and 2016. As can be seen from the bar chart above, capex for the two years is dominated completely by Public Corporations (which include Eskom, Telkom, Transnet, Denel, water boards and various other entities). Of the three groups Public Corporations make up 73.2% of capex in 2016, with National government departments making up 9.8% and Provincial government departments making up 19.2% of capex spending in 2016. While capex has declined slightly for Public Corporations from 2015 to 2016 (-2.3%), there has been strong increases in capex of both national and provincial government departments, with their capex increasing by 13.2% and 17.2% respectively. The bar chart below shows the difference in capex between 2015 and 2016 per Public Corporation for the 10 biggest increases in capex and the 10 biggest decliners in terms of capex. Telkom, Eskom and Aiports company South Africa (ACSA) showed the biggest increases in capital expenditure from 2015 to 2016. 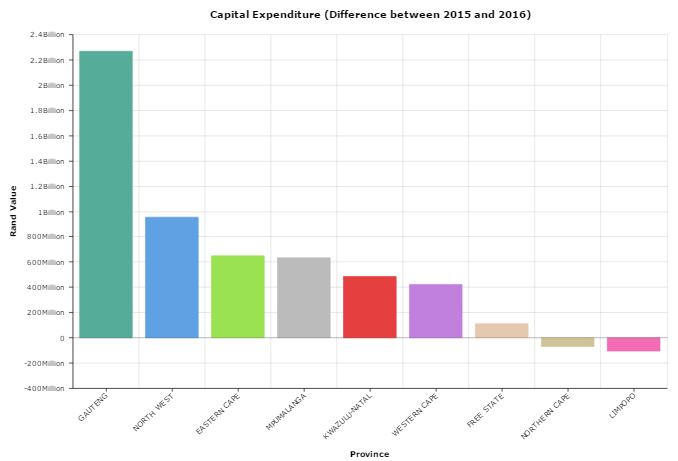 While Transnet, Komati Basin Water Authority and SANRAL (famous for their flopped E-tolls) showed the biggest declines in capital expenditure from 2015 to 2016. While there is a lot of capex from various SOE's one has to wonder how much of it goes to corrupt deals (especially within Eskom and Transet with the Gupta connected Brian Molefe etc having spent time at both of these SOE's). Second biggest contributor to public sector capex is provincial departments. Below we take a look at South Africa's 9 provinces and their growth or decline in capex from 2015 to 2016. The graphic clearly shows that Gauteng increased their capex far more than any of the other provinces, with capex increasing over R2,2billion from 2015 to 2016, which is more than double the amount of the second biggest increase in capex, which was North West. Assumption one can make from this is increased demand for services from the public in Gauteng necessitates increased spending on capex. As we have shown in articles in the past, large sums of people are flooding to Gauteng, looking for work, placing ever increasing pressure on Gauteng's infrastructure. The third biggest contributor to public sector capex is National departments. The graphic below shows the change in capex from 2015 to 2016 for ALL South Africa's national departments. The biggest increase was recorded for the Department of Water Affairs (no doubt the drought and continued issues at water treatment plants leading to increased capex spending of this department). National department of basic education showed the biggest decline in capex from 2015 to 2016. Surprising to see is the department of defense close to the bottom too. One would think with a continued onslaught on SA's borders from illegal immigrants, and aging army vehicles, spending on capex would increase to ensure that SA's defense force can react should they ever need to. Be it to restore law and order in SA's cities or assisting in patrolling SA's borders. While capex has increased by around 7% in the public sector, the majority of that was driven by provincial governments, and not State owned entities as most would expect to be the case. Overall capex by state owned entities actually declined during the period (now if only we can see the same in their operational expenses such as salaries and other operating costs).